Anna Yanovskaya and Sergey Mozgov of Russia perform their Free Dance at the 2014-15 Junior Grand Prix Final of Figure Skating in Barcelona, Spain. Russian ice dancers Anna Yanovskaya and Sergey Mozgov dominated the junior circuit last season and crowned their junior career with the junior world title in Tallinn, Estonia, last March. They had been edged out of the gold the year before by USA’s Kaitlin Hawayek and Jean-Luc Baker, but this time they made sure that nothing and nobody took it away from them. Indeed, the couple stood out among the junior teams during the past two years. Part of the reason is that they are both very tall, have beautiful long lines, and look more grown up than most of their competitors. Although still junior eligible this season at age 18 and 20, the Muscovites decided to move up to the senior level and are busy preparing for their first events—the test skates in Sotchi in mid-September and a Russian Cup series. Following the 2015 World Junior Figure Skating Championships, the ice dancers took a short vacation. While Mozgov defended his diploma thesis, Yanovskaya passed her university entrance exams. Interestingly enough, Mozgov finished his studies at the sports institute this spring while still being a junior. Indeed, education is very important to him. During the past season, he had to work on his diploma thesis and sometimes was writing until two or three in the morning. Now that he has finished his first studies at the sports institute, the ice dancer is thinking about studying something else. Meanwhile, Yanovskaya just finished school and started her studies at the institute of physiculture which will take her five years to complete. However, she would like to pursue an entirely different career. 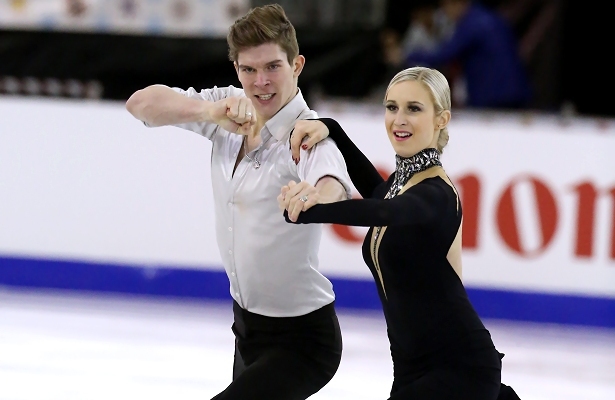 The new season for the ice dancers began on June 2 with a four-week training camp in Liepaja, Latvia, before they returned to their rink in Medvedkovo, Russia, where they began working on the choreography on their new dances. The music for the short dance, which they chose themselves, is to “My Sweet and Tender Beast” by Evgeni Doga. Their free dance to music from “The Great Gatsby” was a team decision. Both their coach, Elena Kustarova, and choreographer, Liudmila Vlasova, choreographed the programs. The ice dancers get along very well and like to spend their spare time together. The Russian junior champions will debut their international season on the senior level at their first two Grand Prix events—Skate America and Trophée Éric Bompard—later this fall.